WiiWare has already seen a few ports of iPhone games, but this one in particular has to take the cake as the laziest of all. 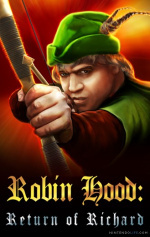 A shooting gallery game based around the legend of Robin Hood, you must protect the people of Nottingham from the seemingly endless hordes of knights running around. As this is a Wii game we're talking about, this is obviously done by aiming using the Wii Remote's pointer and firing/reloading using the A and B buttons. The first mistake is already made right here: firing and reloading come with absolutely zero satisfaction. 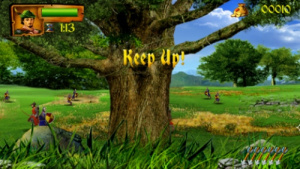 When firing an arrow, you won't even see it flying into the distance, the only notifications that you've even shot it are an almost unhearable sound effect and one arrow disappearing from your quiver at the bottom-right of the screen. Once you've fired your eight arrows, you have to reload, but this is more cumbersome than anything – when you hit B you practically instantly have eight more arrows, so you don't even need to strategically time your reloads. Hitting enemies also has nearly zero effect as all of them let out the exact same weak grunt upon being hit, followed by immediately falling down and disappearing. The enemies themselves look like opponents you'd find in an early 90s full motion video game, except even worse. We wonder how this managed to happen with the 20 years of new technology that has been developed since! They all have extremely limited frames of animation and will for the most part just run from one side of the level to the other. A few fools who think they're clever might stop and try to attack you with their bow, but seeing as this is accompanied by them completely freezing on one single frame of animation before letting their (also invisible) arrow go and continuing to run it's quite easy to notice them before it's too late. You'll also encounter catapult operators and guys who pop up right in front of you, staring at you dumbfounded for five seconds before finally attacking. The guys running around in the distance with swords and torches never seem to attack you, so they could just be completely ignored. Even if you do get hit it hardly matters; you've actually got a life bar and can take a number of hits before biting the dust. And since your life gets refilled at the start of every level, that's not likely to happen! The game's got twelve levels to beat (which is always done by surviving for three minutes), and although the amount of enemies does go up bit by bit they never become much of a threat. You'll rather quickly also get civilians you have to avoid shooting, but as there can seemingly only be three of these on screen at any time and hitting them only makes you lose a few points, this also hardly matters. It's only in the final stage where the game mixes things up a little and throws a boss at you amidst the standard enemies, but as he can easily be defeated before even a third of the survival time is up, it hardly changes anything. Between every few levels and after the final one, you'll get a single static image with some text explaining the story thus far. This is the only way to infer any sort of information about what's going on, because if you want cutscenes or dialogue, you can forget it! After the conclusion, you're simply asked to enter your name on the high score table before being whisked back to the title screen. That's all the game offers in terms of content. There's no extra game modes, which is somewhat understandable, but the developers did not even think to at least include a level select or an adjustable difficulty level. 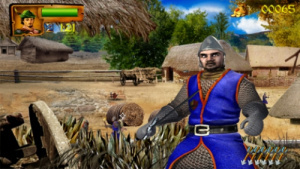 As you can probably tell from the screenshots, the graphics in this are laughably bad. They were acceptable on the iPhone, but there's just no excuse for this version of the game – seemingly no attempts were made to improve them even a little. The backgrounds are all 2D and consist of multiple layers (meaning some stuff further back will go by faster as you're moving left and right) but they look like they were ripped straight from stock photos found with Google. Most of the game's aspects are pretty weird, but the soundtrack is just completely ridiculous. Instead of medieval-sounding stuff, there's a small selection of really fast-paced, completely unfitting tunes that play on every single stage. They're actually surprisingly catchy, and we actually had to laugh at the absurdness of it being coupled with this game. We almost want to say the game is worth playing just to be as confused at the music as we were! If some more work had gone into actually upgrading Robin Hood for WiiWare rather than practically porting the iPhone version over, it could've been a semi-decent shooting gallery title. As it stands, its only good point is the completely absurd music – the gameplay is utterly repetitive and will become very tiring very fast. Stick with one of the few other similar titles available! I knew it would get a review like this. Another iPhone port fail! HwaHwa! At least this was just 500 pts and not 1000 pts like that other turd of a game, Blood Beach. I really don't understand this. It makes publishers like PopCap who make an effort to create a Wii version which is different from those on other platforms seem much more special, but really that's what everyone should be doing. This sounds like a project a trio of college students did in their spare time and then somehow fooled Nintendo into thinking they were a legitimate video game developing company. More bad porting? For shame! Why can't developers put in more money and make a proper port than make this kind of rubbish? 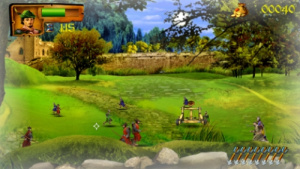 Another iphone game . I wonder though, is this as bad as Warmen Tactics ? Very entertaining review. It's almost worth people releasing bad games just so the NL writers get to flex their insult comedy muscles a bit. I'm serious when I say that I hope someone with the proper equipment pays the price just to record the music, I seriously want MP3s. Looked at the title and guessed 2..... I need a bigger shovel. Somehow I'm not surprised at the score it received. Thanks for the review. Since it's a shooter I was considering getting it but after this it's definitely NOT going to be added to my collection. This game takes the p.
At leasy it had IR controls eh. I actually enjoy these ports. @Bulbasaurus: The publisher, Nordcurrent, is a small indie publisher from Lithuania and whilst they do seem to have a passion for gaming I suspect they lack the budget to get any big releases out. You know I asked this very question a few months ago and it was after playing another crappy iPhone port as well - go figure! Nintendo has to tie in some review scoring system to wiiware search options. It's gotten to the point where new, or even launch owners have a difficult time finding the good games without scouring outside resources for advice. If they want to allow garbage to be sold, fine. But without demos and the barest of descriptions/pics, the nintendo channel doesn't do a satisfactory job protecting the good from the bad. ouch didnt expect much but 2/10!!! just hurts man! @vherub: I've always thought that it would be great for Nintendo to have an option to see all of Wiiware in alphabetical order, like the option for VC. Imo, their management of WW display is terrible. I have to sometimes go online, to find the exact name of the game, so I don't d/l something I don't want, but accidentally could wind up getting. On a side note: that banner for the game, @ the top of the page reminds me of the Cd-I Zeldas. "Your majesty, Nordcurrent, & their programmers have seized Wii shop channel server space." "Hmm, how can we help?" "It is written, Don't d/l this game!" @vherub: I definitely hear what you're saying, I've often said it would be great if there was a button that said something like "Go to the Metacritic page for this game" in the shopping channel when u click more info on a game. That could even be a quality control device in and of itself, as many poorly reviewed games would quickly wither if that sort of information was that convenient on the Wii.